Image Size: 32 X 22.5 in. Unknown Friendships are essential to a woman’s identity. The bond between two women can be as strong as it is delicate. In his latest painting, contemporary artist Henry Asencio sets out to capture the essence of this unique and life affirming bond between two women through color, form and style. Lovely, mysterious and evocative, the figures embrace each other with delicate strength. The women are poised, as if teetering in a moment of connection and liberation. 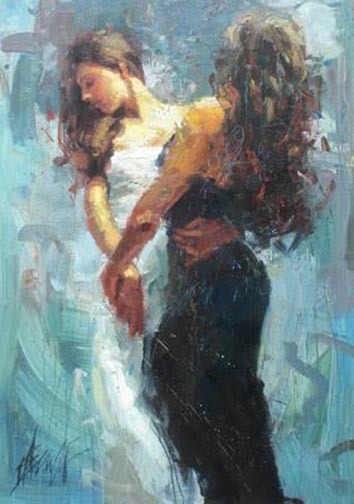 Asencio’s power to communicate unspoken messages of loyalty, love, secrets and salvation is evident here, as is his “Celebration” of the special bond of sisterhood.